Visit the Ngorongoro Crater and see different landscapes. Grass plains, bunches, salt plains and large fresh water Lake called Lake Magad. 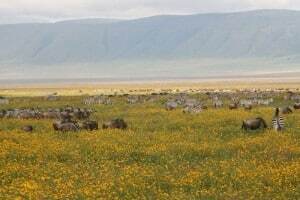 The Ngorongoro Crater in is the largest intact caldera in the world. With a diameter of nearly 18 kilometers, an area of 260 km2 and a crater wall which is more than 600 meters high. A caldera collapse formed by a funnel-shaped crater in the volcano. This crater is inhabited by about 40,000 Maasai, which 200 years ago, the Mbulu and Datoga tribes expelled. In 1951 the area of the crater was added to the Serengeti National Park and since 1978 UNESCO declared this huge Ngorongoro crater to World Heritage. This crater is located in the Ngorongoro Reserve (Ngorongoro Game Reserve, 8000 km2) and there are an estimated 30 000 animals in this crater. This makes this crater one of the most densely populated areas in the world game. A remarkable natural phenomenon of the Ngorongoro are the so-called “shifting sands”. Shifting sands are a type of dune, which is about 30,000 years ago during the eruption of the volcano Ol Donyo Lengai, is formed from ashes. Every year, during the dry season, moved hundreds of meters long and nine meter high dunes’ sand and ash on average about seventeen meters to the east. The Ngorongoro Conservation Area reaches from Karatu to the Serengeti, the total surface of the park amounts to 8300 square km. 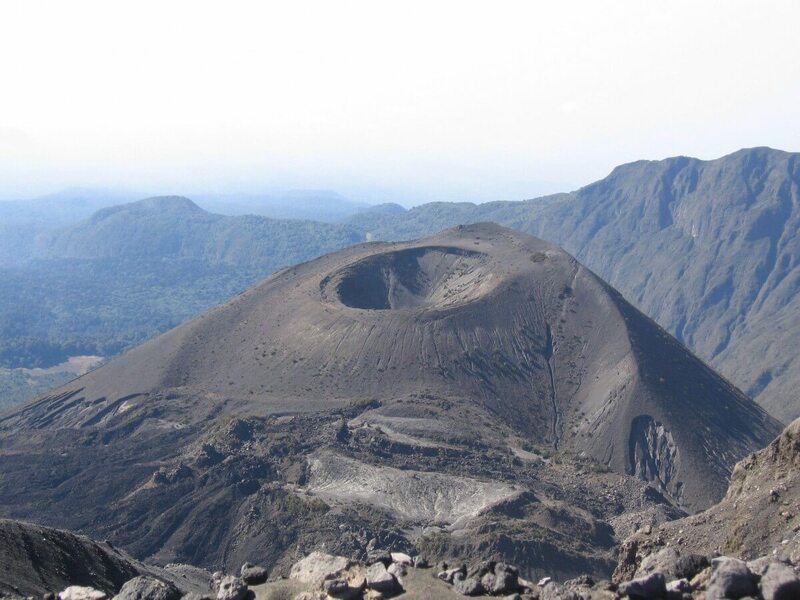 The crater used to be a mountain with the same altitude as Mount Kilimanjaro, approximately three millions years ago, an enormous eruption exploded the complete mountain, the crater floor decreased, and the present crater park arose. The crater only has a cross-cut of approximately 20 km. The crater floor has a lot to offer, you can see approximately 50000 wild animals such as, zebras, wildebeests, hippopotamuses, gazelles, lions, elephants, buffalos, spotted hyenas, cheetahs, several types of monkeys, and the black rhinoceros (there are no see giraffes, those cannot descend the crater with their long legs). The crater floor has a lot of different landscapes to offer, you can see grass plains, bunches, salt plains and large fresh water Lake called Lake Magadi, In the lake you can find a multiple species of wildfowl, and large groups of flamingos. At the entrance a small museum has arranged where you can see among other things the history and the existence of the crater. Then you drive to the top of the crater edge (2250 metres), here you have a fantastic view of the whole crater. On the crater floor you will see different dark spots, and when you take your binoculars you see that these are groups of zebras, wildebeest or other groups of wild animals, it is an unforgettable sight. In a relatively small area you encounter a lot of different wild animals, you also have a big chance to see a ‘kill’ in this park. Furthermore Olduvai Gorge is located very close to the Ngorongoro crater, herein Mary Leakey found 1.75 millions old fossils of the first human beings called Homo Habilis. They gave him the name ‘the handyman’, because he could already manufacture good tools. (For further information see Olduvai Gorge).